Experience the adventure of Nootka Sound! Breath taking scenery with fishing opportunity seldom experienced. 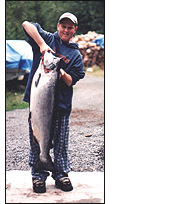 Challenge a Mature Chinook (King) Salmon on light tackle averaging 24 - 35 pounds and a good possibility of a fish over 40 pounds. We will be intercepting fish returning to the Conuma River where a hatchery has consistantly kept spawning salmon retutning in above average numbers and size. 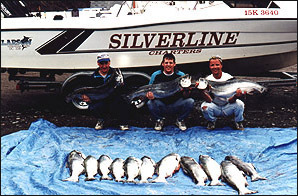 Your fishing adventure with Silverline Charters will be aboard a sturdy 23 Hourston. 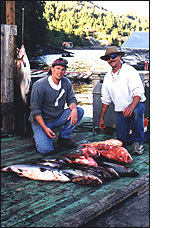 Bill Sargent will be your personal guide who has fished the West Coast of B.C. for the past 20 years. He has been fishing Nootka Sound for the past 10 years. Bill uses the latest electronic gear, Lowrance/Eagle depth sounders, GPS Navigation and VHF Radio. Onbard ammenities include a washroom in the Cabin and all seating is undercover. In the fishing department, Bill uses Scotty electric downriggers, light rods, Shimano level wind reels or the more traditional Shimano "Knuckle Busters" depending on your preference! All preferred types of tackle, bait, spoons, plugs and hootchies. When one tires of fighting Trophy Class Salmon, an angler can challenge the abundant bottom fish in the area -- Red Snapper (Yellow Eye), Ling Cod and Halibut are the targets when out on Bajo Reef -- which is an adventure in itself. For the more adventursome, the "Outside" West Coast of Nootka Island offers scenery unparalleled with historic sites (Friendly Cove) and spectacular rock formations to remote sand and gravel beaches. For the more timid, the placid waters "Inside" Nootka Sound offer Coastal beauty with eagles, black bears, seals, oyster beaches, calm water and exceptional Salmon Fishing in all areas. Contact Bill Sargent and plan for your trip today. From Campbell River, BC: It is a 2 hour drive west along Highway 28 to Nootka Sound.